Are you wondering how your baby can have an interesting and fun experience in a safe environment? Baby bouncers will give your baby exactly what you are looking for. Sometimes, you need to handle a quick chore but still, your child cannot allow you if he/she is in your hands all day. The right baby bouncer will keep your kid engaged as you do some stuff in the house. Getting the best baby bouncer is however not so easy, because the market is flooded with numerous brands and models for you to choose from. Below are some baby bouncer reviews that can help you out with your decision-making process. From the list pick the one that best represents your needs and lifestyle. Bouncer Type: There are 3 types of baby bouncers. They include sleeping bouncer, basic bouncer, and an activity bouncer. From the 3, pick the one that best represents the needs of your baby. The basic bouncer is highly portable and has no toys. The sleeping bouncer reclines to give your baby a great sleeping environment. It comes with a blanket as well. The activity bouncer, on the other hand, distract your baby with the entertainment toys it comes with. Portability: In case your baby loves a particular bouncer, you might have to carry it around. This is where you consider portability. Your choice of bouncer should, therefore, be easy to carry and lightweight. A foldable model is better in case you move a lot. Safety: Your baby’s safety cannot be compromised. This implies that you should buy a bouncer that comes with strong safety features to keep your baby safe. Straps should be soft but sturdy in order to give your baby both comfort and support. Are you in search of a baby bouncer that can keep your toddler engaged as you go about your chores in the house? Well…. this Bright Starts baby bouncer is one of the best baby bouncers available in 2019. The product is perfect for kids that weigh up to 9 kilograms. Its look appeals to the eye as it is covered with delightful animal prints that your baby will love. Additionally, the product comes with fun playtime toys and generates gentle vibrations on its own. This way you can be sure that your baby will remain engaged without getting bored as you take some rest. One of the best things about this product is that it is comfortable and it comes with a deep supportive seat for your baby. For the sake of hygiene and the health of your baby, this product is machine washable. Far from that, the baby bouncer has a 3-point restraint harness that is adjustable. You can use it for both baby boys and girls. It is one of the best that you will come across. Order it today and enjoy your kid’s comfort and peace of mind. Are you looking for the best baby bouncer that is portable and gives you easy access to your baby? This is Silver Cloud product is exactly what you are looking for. The best thing about it is that it does not need batteries to function and this, therefore, cuts off the cost that you incur after purchasing it. it is a beautiful product that will always the interest of your baby. On this item, there are toys that your baby can play with as you do other household chores. This implies that your baby will rarely get bored when on this bouncer. It has also been made in such a way that it vibrates on its own, giving your baby a fun time while on it. The seat of this baby bouncer is one of the best because it is very comfortable. Therefore, your baby will rarely experience discomfort and fatigue when using it. This product is made of cotton and lycra materials. It is specifically made to offer balance to you baby bouncer. The product is soft to the touch and it is soothing for the baby. You can use this product during both summer and winter. This is mainly because the materials that make this product are breathable. Add an elegant look on your baby’s bouncer with this product. It comes with various colors which give the bounce an original and chic look. This is one of the best baby bouncers on the market today. One of the reasons why is because it comes with premium quality fabrics that give your baby softness and comfort. Therefore, there is no way your baby will have to deal with fatigue or discomfort when using this product. The fabric of this product is also hypoallergenic. This implies that the material does not support microbes that can cause harm to your baby’s health. Additionally, the bouncer comes with a contemporary design that will add a touch of elegance to your house. You can use this product for very young babies because the bouncer comes with a bolster and a plush headrest. As your baby grows, you can get rid of the bolster and headrest to accommodate your grown kid. With 100% polyester material, this baby bouncer is one of the lightest to carry around. Apart from being lightweight, the product is very comfortable for your baby. It has also been designed for easy home use when you need to do a quick household chore. The bouncer comes with 4 different positions which make it possible for your baby to play or rest. To ensure that you can easily store or transport it, this baby bouncer completely folds flat, facilitating easy storage and portability. It also features a luxurious design and it does not add you extra expenses after purchase. This is mainly because it is designed to have a natural bounce that does not need plugs o batteries. This is one of the most comfortable baby bouncers on the market. It comes with a comfy and deep seat which helps to keep your baby cozy and relaxed. To keep your baby calm and soothed, this product has been designed to give gentle bouncing actions. With the serene music and optimal calming vibrations, your baby will always be happy, calm and relaxed when on this product. The baby bouncer can last for a long period of time and therefore, you do not have to buy a new bouncer every moment you have a newborn. It comes with that extra plush body, seat and head support. This is meant to boost the coziness and comfort of your baby. Here is a highly affordable and high-quality baby bouncer of all times. 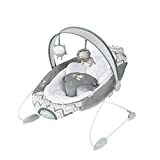 With this deluxe bouncer, you save up a lot of money that you could use buying a high-end baby bouncer that will perform similarly to this one. Additionally, the product comes with a natural bounce that relieves you the burden of buying batteries or charging it. This implies that your baby can always be calm regardless of whether you are indoors or outdoors. Your baby can enjoy 20 minutes of nature sounds and music with this baby bouncer. Better still, the volume can be controlled to suit the mood of your baby. 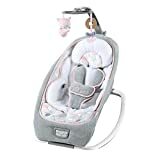 This baby bouncer comes with a deep seat that has plush fabric, soft head support, and body insert. All of these features are meant to keep your baby comfortable and relaxed. Do you need a baby bouncer that gives your baby extra comfort? This Baby Einstein bouncer is exactly what you are looking for. It features deep and cradling seat design that has mesh panels that give your baby that extra comfort. There is also a toy bar to keep your baby busy and engaged. This toy bar can be removed when washing the product. For entertainment, this product comes with a c-link and removable fabric flash cards. 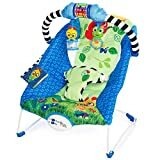 The caterpillar bead chaser and red bird toys on this bouncer feature a pull and spin design with discovery paddle that resembles real-life imagery. Therefore, with these amazing features, your kid will always feel calm and engaged. 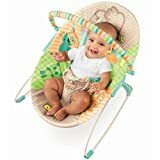 This baby bouncer is one of the best and most comfortable for your baby in 2019. It comes with a secure baby seat that has been designed for multi-taskers. The best thing about this baby bouncer is that it mimics a mother’s natural movements. This is facilitated by the 2-sped auto-bounce feature it comes with. To take care of your baby’s hygiene, this bouncer comes with a machine washable seat pad. There is also 3 point safety harness that is adjustable. You will love the long lasting batteries that come with this product. Therefore, it saves you money that you could use to regular change batteries. It is the best neutral bouncer that can be used by either a baby girl or boy. Here is the best baby bouncer in 2019. It gives your baby the most amazing play time as they relax. There is a removable toy bar on it and it features rattling fox rollerball and owl clacker rings on it. To give your baby the best soothing, this bouncer calming vibration s that you can switch on. The seat pad is machine washable keeping your baby’s bouncer clean and hygienic. Your baby will also be safe when using this bouncer because it comes with a 3 point restraint that is adjustable. The snuggle spot of this product is secure and it features a modern and non-skid design. In spite of having high-quality features and amazing functionality, this bouncer comes with a pocket-friendly price. Order one today and watch how calm and relaxed your baby will turn to be. The safety and comfort of your baby are key things that you cannot compromise when buying a baby bouncer. Therefore, do not just consider the affordability of the product and neglect the important factors that can affect your child’s growth and development. Nonetheless, this does not mean that you should spend a fortune on a baby bouncer. There are numerous products on sale today that have a pocket-friendly price tag and still have great functionality. From the above list, you will find both high end and affordable products that you can choose from. All of them are of high quality and they are safe and secure for your baby. Pick the one that best suits your budget, needs, and lifestyle.